GEJE Eustaquio is highly motivated to retain his ONE Championship world title following the loss of former strawweight world champion and fellow Team Lakay Joshua Pacio last week. Eustaquio squares off once again against former world titlist Adriano Moraes in the first trilogy of One Championship as they both headline “Heroes Ascent” on January 25 at the Mall of Asia Arena. Both flyweight had a score to settle as Eustaquio and Moraes are 1-1 in their encounter inside the ONE cage. Moraes defeated Eustaquio in 2014 to win the inaugural ONE flyweight world title in Cambodia. But the Team Lakay exact revenge four years later to unify the flyweight title in June last year after defeating Kairat Akhmetov earlier in 2018. “15 years ago I made the biggest decision of my life to pursue martial arts. No one believed that I would be standing here in front you all as a world champion. But now, I have learned throughout my career and my training that the word impossible doesn’t exist. With the help of my coach and my team, we have achieved success,” Eustaquio said during the kick off press conference Tuesday afternoon in Manila. The Team Lakay fighter added he is extra motivated to win their trilogy with Moraes after Pacio suffered a tightly contested split decision against Yusuke Saruta. 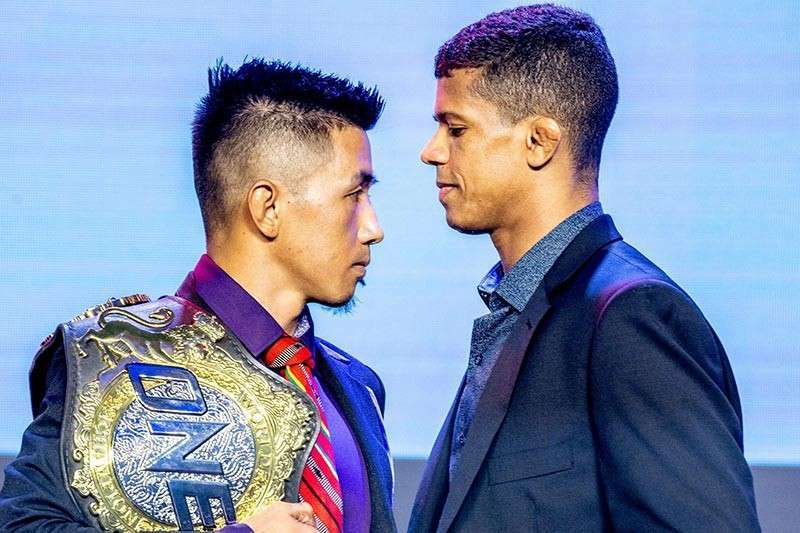 Eustaquio added his match–up against Moraes will be a first in One Championship’s history while downplaying the team’s critics. “If I listened to those who were saying I wouldn’t make it, I would not be standing here in front of you all today. This Friday night, me and Adriano [Moraes] will make history in the first ever trilogy bout in ONE Championship. I invite you all to come and watch,” added the former University of the Cordilleras student. Moraes meanwhile vows to get back at the title and promised to come out as a better fighter in his match – up with Esutaquio. “The Adriano that fought Geje in the last match, I can say with confidence that it wasn’t me. I wasn’t myself in that bout. This time, I have prepared very well for this third bout. Whatever happens, I am ready to give my best. This is going to be a good fight. I am looking forward to it,” he added.